Another two pieces. These are about panic, like the others. 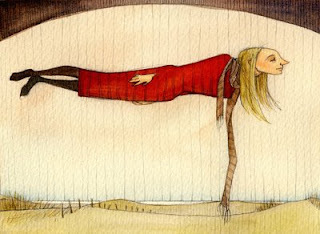 The girl in the air, a dream of flying, looking at the curve of the earth (she is not panicking and has a pleasant emotion, perhaps just before the fright). The blue winged thing is an angel. I have often felt an enormous sense of fear, ever since childhood, when thinking about heaven, hell, and angels. 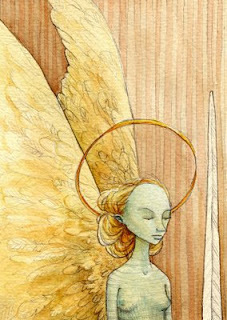 This is a representation of the mystic angel that is at the gates of paradise, and her sword. She is blue, like the gods you will see in Indian art, which I find interesting and unnerving. This is a new piece for the show called "don't panic" . It is about the worries related to being a female, and specifically toxic shock syndrome, a terribly scary name for an equally scary disease. 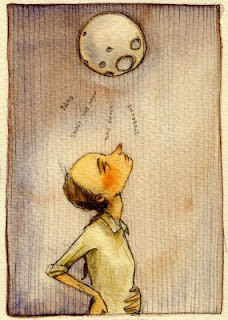 It is a contemplation of the moon, of death and of the fear about the horrible things that can happen to our bodies. The personal element is that my mother (among her many unreasonable fears) opposed the use of tampons, which can cause tss, and instilled a fear of them in me. There are so many things to do in the world! Here I've taken photos of a pillow and two new books. The quilt pattern on the pillow is called Tennessee Waltz and I made it using a sewing machine a while ago. I made one then for Jesse, and this one but never had the chance to finish it until now. The green border is hand stitched because I don't have a machine to use here, but I quite like how it came out and was successful in my "blind stitching". Both of the books are pamphlet style and filled with graph paper. The design on the cover is a lino-cut, which I really like working with. I have been invited to share a table at a book arts fair in Liverpool, so I am starting to make more of them in order to sell and also a few personal books to show to people. It's so much fun! 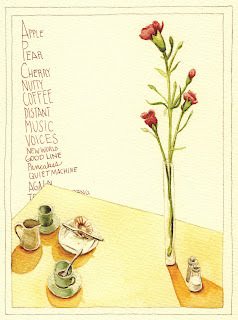 The painting is a watercolor and based on a sketch I did at the veggie cafe on Lark Lane called Green Days. It was really nice how the cups and things were arranged on the table and how the shadows fell. Jesse was actually sitting there studying, but I cut him out! Here are two new watercolors. 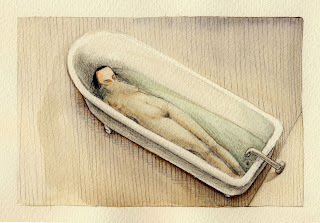 The one of the woman in the bathtub is the first in a series I am making for a group show. Two friends and I are putting together a show at Wolstenholme Projects, Liverpool city centre, where one of them has a studio. The title is "Don't Panic!" and my intention is to convey the fear or anxiety that occur in dreams as well as strange moments of panic in waking life. My aim is to have a range of images, some quiet, some humorous, and some more on the nervous side. I hope to show the scope of the state called panic. 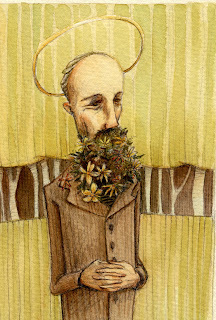 This "flower beard" is a man who I think fits into my panic theme, though I'm not sure he'll be in the show. He represents old age and the reverence I feel towards age and those who live well in it. His flowering beard is the beauty this man holds in the later season of his life. After awhile I saw the similarity between this piece and my "Don Quixote" (first post on this blog) which is pretty neat. It was completely unintentional and so I can suppose that this is just part of my thought which insists in being known!